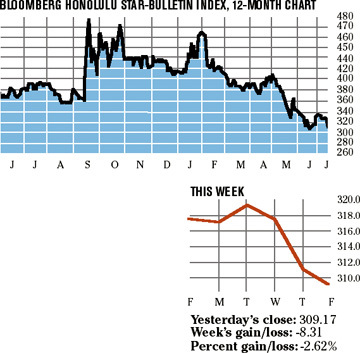 ML Macadamia Orchards LP was the sole stock to post a gain this week in the Bloomberg Honolulu Star-Bulletin stock index. ML Macadamia closed at $5.45, up 0.93 percent for the week. Year to date, it is off 6 percent. Over the last 12 months, it is down more than 10 percent. 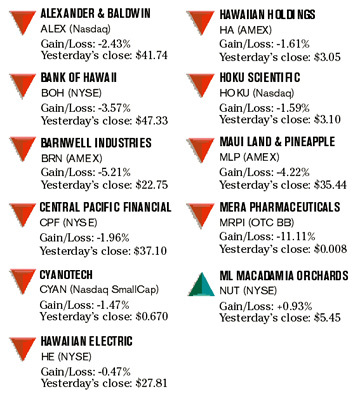 Second-best in the index this week was Hawaiian Electric Industries Inc., just barely in the losing column with a decline of 0.47 percent, to close at $27.81. Year to date Hawaiian Electric is up more than 7 percent. For the last 12 months it is up nearly 2 percent.